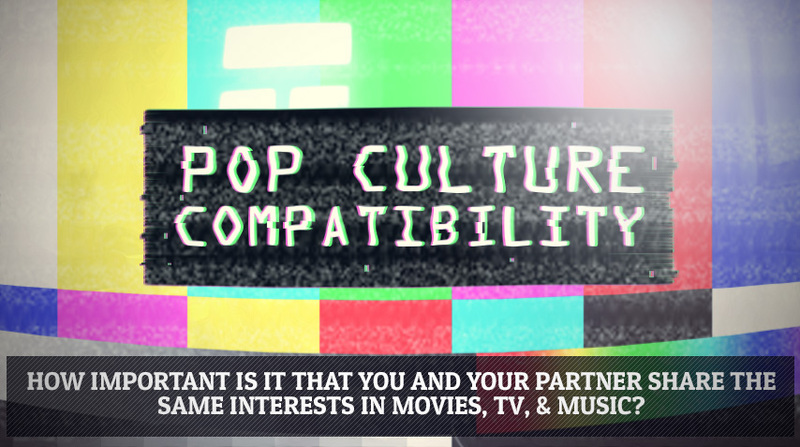 Are a partner's pop culture preferences a deal breaker? I'm a pop culture junkie. An obsessive. My life has been marked irrevocably by the books, films, TV shows, video games, and music that I've loved, hated, or simply experienced. My pop culture tastes both make up part of who I am, and reflect who I am. And, while I may be an extreme case, I'm certainly not alone in this. As the internet has made pop culture even more accessible and ubiquitous, so too has it helped people be selective in their consumption, forming strong tastes and preferences as to what they'll devote their increasingly limited free time to. But if pop culture is such an important part of our lives – and ourselves – shouldn't it also be one of the main criteria by which we select our partners? Why should I put up with a girlfriend who thinks that music starts and stops with David Guetta, who doesn't appreciate why I think that Alien is the pinnacle of modern cinema, or, as might be most likely of all, can't understand why a video game like BioShock Infinite might be more powerful, thoughtful, and artistically worthwhile than most of the films Hollywood put out this year? These things are all important to me – and so, for me, they're important in a partner too. As with all important aspects of life, High Fidelity got here first of course. In the film (sorry book fans, I’ve only seen the adaptation) John Cusack’s character utters a line that struck me the very first time I heard it: “What really matters is what you like, not what you are like.” To my ears, this is plainly true. But, since I'm wrong so much of the time, I thought I'd try to pick this attitude apart a bit. This may apply more to films and TV than to books or single-player video games, but you're going to want to actually watch the stuff that you love. But you're also going to want to watch stuff with each other. And if your tastes don't match up, then you'll be spending a lot less time catching up on your favorites, and a lot more time watching stuff you just can't stand. If you both love the same things, you both get to enjoy what you love. Much better. 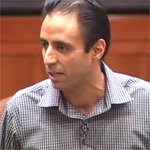 If you're waiting for that perfect person whose tastes match yours in every respect, you might be waiting for a while. No matter who you're with, you'll always find stuff you disagree on, and hoping otherwise is just setting yourself up for disappointment. A certain amount of incompatibility is unavoidable, so there's an argument for not worrying about it at all. People don't interact with pop culture in a vacuum, their tastes tend to reflect who they are. Someone's pop culture tastes can tell you all sorts about them, from their intelligence to their politics, and from how kind they are to how open-minded they are. You might expect someone socially reserved to have less experimental taste in culture, for example. The point is, pop culture can help you find partners with a similar outlook on the world to you, or a complementary personality. Our tastes often only reflect the sort of things that we've been exposed to. Perhaps you could only ever see yourself dating another jazz fan – but what about when you meet someone who's never listened to any jazz? They don't like it, but only because they haven't had the chance to like it, not because of anything fundamental about their personality. 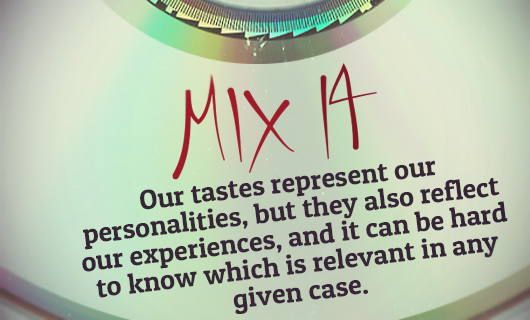 Our tastes represent our personalities, but they also reflect our experiences, and it can be hard to know which is relevant in any given case. One of the great benefits of having friends with similar tastes is that you introduce each other to new material that you might just come to love – and the same is true of partners. If you can trust your partner’s taste in films, then they might just introduce you to that classic that you missed, or the obscure, yet brilliant, indie movie that you never came across. Now you have a new favorite film, and you have your partner to thank for it. The above is certainly true – but doesn’t it hold equally well when you don’t have much taste in common with someone? This time, instead of being introduced to films that are similar to your shared taste, you might get introduced to a film that goes against everything you thought you liked – and it might just turn out that you love it anyway. Partners with polar opposite tastes are a great way to challenge your presumptions about your own tastes, and introduce you to stuff that you’d never normally give the time of day. Even more so than partners, your friends are likely to be people who you have tastes in common with. That’s how most people’s friendships start in the first place. And if you want your partner to get along with your friends – and for you to get along with theirs – everyone having some pop culture in common is the easiest way to make that happen. Suddenly your friends and your partner can chat about the latest episode of Game of Thrones while you talk to their friends about the latest Tarantino film. Win-win. It’s brilliant sharing your life, and your tastes, with your partner. But it’s also important to have your own time – and your own tastes. Not only do you want to remain individuals, but you want to be able to go off and dive into the latest video game or novel that’s just for you. If your tastes are too closely matched, it’s much harder to delineate time and activities that are just for each of you. A bit of separation in your tastes can go a long way in keeping you separate people – the importance of which is far too easy to underestimate. I know which side of all this I fall on. For me, it’s what you like, every time. I don’t want a partner who has the exact same taste as me, as I love getting the chance to be introduced to new things, to be challenged on my own tastes, and to just go away and play a game on my own knowing that it’s purely for myself. Having said all that, I couldn’t imagine a relationship where I couldn’t stick my favorite album on and trust that my partner will enjoy it too, or talk about my latest film obsessions and know that they’ll care. Pop culture is my life, and it’s a big part of what I want to share with partners. In that sense, I think that High Fidelity presents a bit of a false dichotomy. It isn’t a question of what you like versus what you are like – they’re the same thing. Yep, she thought it was all fun and games – until I got her hooked on minecraft! This is a great article on a super interesting topic. It really all depends on personalities. Personally I just can’t stand the same formulas of romantic comedies and I think my GF understands that. However she likes my taste in TV and movies so at least that part fits. I think it is all about understandings. Ummm…two television sets….helloooo…DVR doesn’t fix everything!